When not-so-popular Lucas finds out he is not really a human, but actually a monster, the news changes his whole world! Embarking on a quest to Monster Island to discover his real roots, Lucas undergoes a journey he will never forget. He finds himself face to face with more tentacles, fangs and far-out situations than he can shake one of his new wings at. Ultimately Lucas learns that being a freak, isn’t freaky—it means you’re a member of a brand new type of family that you can proudly call your own. KIDS FIRST! Film Critic Carla P. comments, “Monster Island is a great film because of its animation and unique storyline. I love how the monsters are animated.” Jolleen M. adds, “This animated film is hilarious and is made with great quality. I love the colorful and detailed animation. The storyline is different from other monster films, which makes it stand out. “ See their full reviews below. Monster Island is a great film because of its animation and unique storyline. I love how the monsters are animated. I also adore the storyline. It’s something I’ve never seen before. Monster Island is about a boy named Lucas who’s a monster, but doesn’t know it since his dad hid it from him his whole life. His dad has given him a potion to stop him from turning into a monster by hiding it as an inhaler. When Lucas forgets his inhaler at home to go the biggest party of the year, he turns into a monster which scares everyone. Luckily, his dad comes to the rescue with his inhaler which turns him back into a human. His dad explains what’s happening and where he got his powers from. Turns out, they’re from an island called Calvera. Lucas goes on an adventure to find this island. But will he find it? Watch it to find out! The animation reminds me of Frankenweenie and Coraline which are some of my favorite Halloween movies. 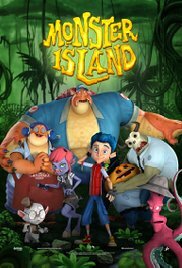 Unlike Frankenweenie and Coraline, Monster Island is all computer animation. However, it looks like claymation. I’m fascinated by the attention to detail. Every monster is unique. There are squid monsters and humongous monsters who tower over people. I love the characters in this movie. Two of my favorites are the two police officers. I love their banter as they try to catch Lucas, but always fail. I love how the pumpkin monster is the “brains” of their team while the deer head monster is the tough dumb one. They had me cracking up the whole time. The message of this movie is to accept yourself. Lucas’ uncle tries to become a monster since he never became a monster. He felt left out because all of his family are monsters, but he isn’t. Although his family loves him either way, he still tries to find a way to become a monster through science. I rate this film 5 out of 5 stars and recommend it to ages 6 to 10. You can find this incredible movie online now so, go check it out. Available on YouTube, Google Play, Budi and more. This animated film is hilarious and is made with great quality. I love the colorful and detailed animation. The storyline is different from other monster films, which makes it stand out. The story line is about a boy named Lucas, who doesn’t know that he is a monster. His dad has been keeping the truth from him, until he is ready to handle it. Lucas takes medicine every 24 hours so he doesn’t get “sick.” At least that is what his father told him. But one night he forgets to bring his inhaler with him and he turns into monster form. He is completely shocked, as is everyone around him, for he did not know he had this inside of him. His dad gives him a small explanation, but Lucas, wanting to know more, goes on a journey back to his birthplace. He goes back to Monster Island, to figure out who he really is. The Director Leopoldo Aguilar has created a very original and interesting film. The style of animation that Art Director Jorge Carrera has created really detailed and realistic, without looking too scary, animation. The animation is so colorful and pleasing to the eye. The music of this film by Ricardo Solis, really sets the tone for the film and adds suspense, which makes everything interesting. The music can tense you up or just make you feel really happy for no apparent reason. The music is a crucial part of any movie and Solis’s score truly makes this film even better! My favorite scene is when Lucas turns into his monster form for the first time at a party. I really enjoyed this scene because everything is put into play. The music adds to the suspense, the animation of Lucas transformation and the zooming in increases the tension. This scene has a lot of key elements that makes it my favorite. The message of this film is to embrace who you are. Lucas, at first, does not like the idea of being a monster, but he soon realizes that it’s not so bad. Just because you are different doesn’t mean that you are alone. This is a really important lesson to teach kids because, some kids want to fit in and be like everyone else. If they aren’t, they think that they are not good enough. But Lucas shows that no matter what, you are special in your own ways even if you don’t realize it. There is always someone out there who will love you for who you are. Monster Island is inspirational and just a very interesting film to watch. I give it 5 out of 5 stars and recommend it for the ages of 4 to 12. Monster Island is available online at YouTube, Google Play and other locations now so, go check it out.